Brian Tee | No Chic. Just Geek. 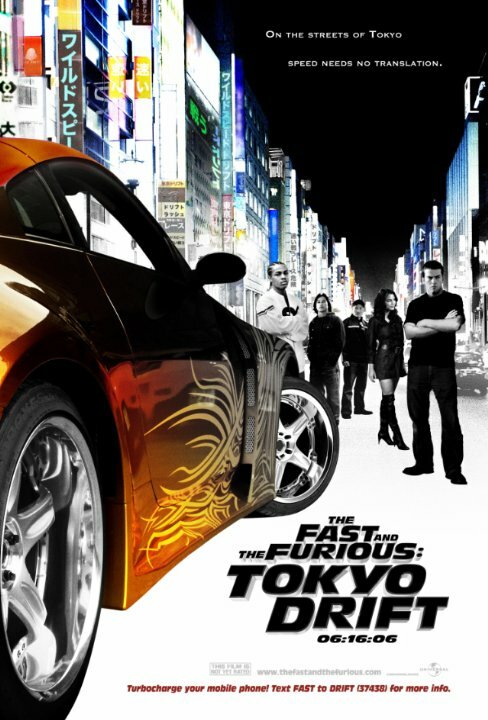 When Justin Lin’s The Fast and the Furious: Tokyo Drift first came out in 2006, it did okay for itself, though it didn’t quite cross the double-its-budget box office threshold that apparently is the requirement for a film to be considered a genuine success. Most people dismissed it as a clutching-at-straws third instalment of series which had run out of ideas (not to mention original cast members). Not-quite-ten years on, of course, with the Fast and Furious franchise elevated to world-bestriding colossus status, it has acquired a certain curiosity value – is it the franchise misstep it initially looks like? Like I said, the main characters of the series are distinctly thin on the ground this time around, and protagonist duties are left to Texan bad lad and (inevitably) boy racer Sean Boswell (Lucas Black), who at the start of the film is expelled from high school. This is not, as you might have thought, because he is visibly about 25 and much too old to be at school – everyone at high school in Texas seems to be well on the way to their thirties, which is not a great advertisement for the state’s education system when you think about it. No, Sean gets kicked out for racing, predictably enough, and is packed off to stay with his dad, who is living a slightly sleazy expat lifestyle in Tokyo (which often looks suspiciously like Los Angeles with bits added via special effects). Despite not speaking or reading a word of Japanese, he is nevertheless packed off to the local Japanese school. Here he makes friends with a comic relief sidekick (Bow Wow), who is not Japanese, and sort of starts a bit of a thing with a hot-looking girl (Nathalie Kelley), who is not Japanese either. All this inevitably leads Sean to the local street racing circuit, where finally a (these days at least) familiar face appears – it’s Han from the Fast and Furious All-Stars (Sung Kang), who isn’t Japanese either. When Hot Girl’s boyfriend Takeshi (Brian Tee), who is actually Japanese, takes exception to Sean putting the moves on her, a race inevitably breaks out – but Sean’s skills at going very fast in a straight line are of limited value in Japan, where one apparently wins races by going very fast round corners in a manner I would describe as fairly unsafe. Having wrecked one of Han’s cars and lost this vehicular combat, Sean finds himself having to do odd jobs for Han. But will he win the heart of Hot Girl? Will the simmering rivalry between Sean and Takeshi ignite again? And will he ever manage to learn how to go around corners properly? Now, enjoyable as I find the Fast and Furious movies, even I will cheerfully admit they are not exactly highbrow entertainment – but even by the standards of the series, Tokyo Drift is an unusually vacuous piece of work, as you may have noted from the the number of times ‘inevitably’ and ‘predictably’ crop up in the synopsis just above. To say the plot is contrived and more than a bit silly is an understatement, and while all of these films have a glossy sheen, this one has little else. These days, Asia is such a major market that it’s quite common for films to incorporate Asian characters and even extra scenes just to appeal to crowds over there, but I doubt the decision to set this film in Tokyo was made with an eye on seizing the audience’s yen: if so, they would probably have included a single sympathetic named Japanese character. (There’s kind of a suggestion that Hot Girl may be half-Japanese, but the film virtually admits that she’s just there to be ornamental and doesn’t bother with giving her any depth.) But they don’t – every local whose name we learn is either a local thug or an actual member of the Yakuza. Being – well, calling it ‘heroic’ is pushing it in a movie where the height of moral and personal achievement consists of going round a corner at high speeds while not pointing the right way, but whatever – is left to the expats. Japan is just there because it looks nice and because it presents some interesting cliches to mess around with (Sean gets into a bit of a contretemps with a sumo wrestler at one point, who is very unflatteringly depicted). In short, it’s an eminently dismissible entry in the series, or would be if recent instalments hadn’t tried so heroically to retcon a little significance into it. If you’ve seen the later films in which he appears, Sung Kang’s performance here seems loaded with a kind of soulfulness and significance that probably just wasn’t there at the time the film came out: in any case, as the main link to the rest of the series, he does a sterling job. There is also the pleasure of imagining a surly-looking Jason Statham lurking just out of frame for much of the film, as we must now imagine is the case. It really does tie in with the other movies remarkably well: one has to wonder just how far in advance, and in how much detail, they plan ahead. Having said that, I suspect they’re just very good at improvising and stitching bits together, because if in 2006 they were planning to make a series of very good films some years down the line, one has to wonder why they didn’t make a better one at the time. Tokyo Adrift would probably be a better subtitle for this one – most of the elements that make this series fun are present and correct here, but it’s even dumber than usual and you really do miss the regular characters. The film is kind of flopping about trying to find a reason to exist and not quite managing it – if the next four films hadn’t gone on to be such massive hits, I doubt anyone would spare it very much thought at all.